News from Chrispy! Listen up! After being broken for, uh, more than a year, my news section is syncing again. And I need content for it! Since my chronic illness is still doing a number on me, it may be a while before a *proper* news post can go here. So... Enjoy this placeholder image! I may not be able to do MUCH, considering how broken I am, but I still intend to update every single day. All extra stuff, from email communication, to side projects, to whatever, are indefinitely on hold. I can't predict when my body will allow me to do this stuff. (Even writing this blurb will likely trigger a migraine - yay!) Just know I'm here and giving 100%. 100% of zero is zero, but STILL!!! Precocious at the Small Press Expo! For second, and final, time this year, I'm leaving my isolation chamber to table at a convention! The Small Press Expo is a great show for comics lovers, because it has EVERYTHING one could want. 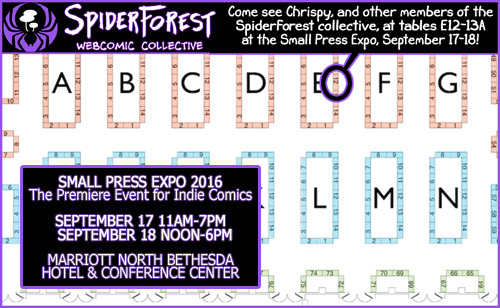 I'll be there with my fellow SpiderForesters, at tables E12-13a. DC area, people, it's definitely worth the trip - and TICKETS TO IT ARE CHEAP! I'll have the three Precocious books with me, and might do some small commissions. Any other goodies, like charms, will probably be there. Along with my stuff, the table will feature lots of awesome SpiderForest comics to buy! And here's a general reminder that I'm still REALLY broken and sick (I have a special med I can only take once a week that lets me be "normal" for these shows) and that means all sorts of stuff is on hold until I can improve. 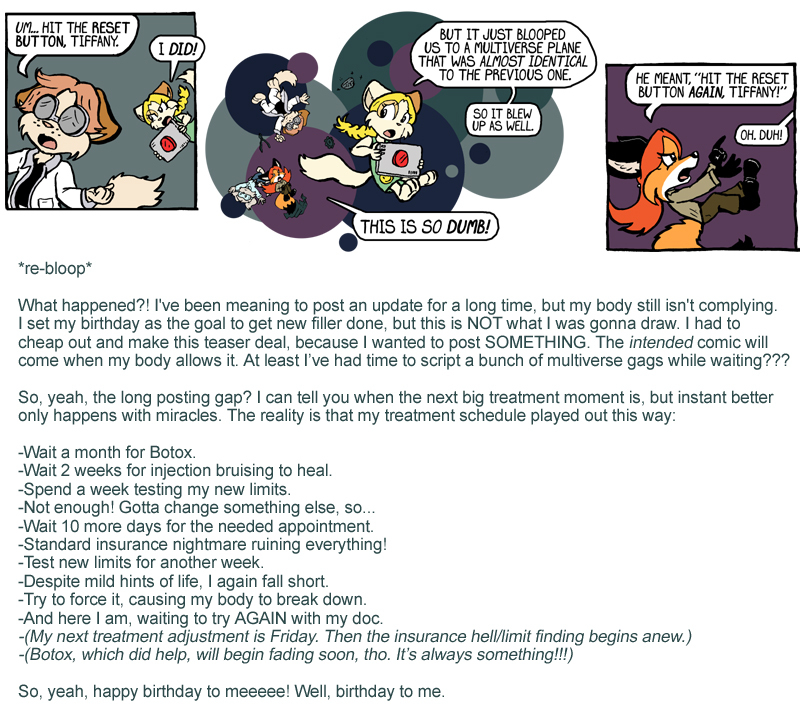 I'm months behind on emails (and might never manage to reply to some, because writing anything longer than a tweet, like this post, takes a LOT out of me), and any work beyond comic updates is currently beyond my ability. I know the site is broken or outdated in various places, and my store remains disabled until I feel like I'm able to do regular post office visits again. All I can do is ask you to wait and keep the faith. I haven't forgotten or deliberately ignored anyone - I'm just stuck in survival/treatment mode until I can get moving again. You all are my motivation to keep fighting! In my broken state, I only allow myself to do two social things a year, so here they are! Coming up WAY TOO SOON, is Anthrocon. I will be there! You should be there. 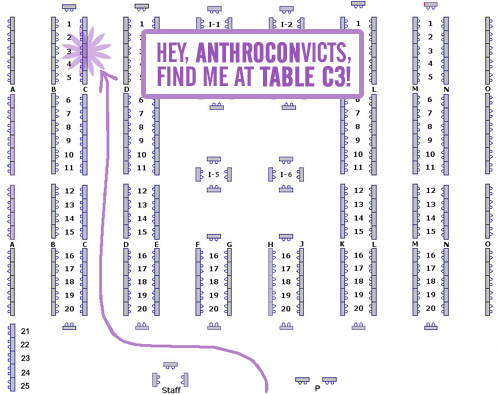 Specifically, at table C3, buying my three books in-person, so you can get a nifty sketch in them! And you can talk with Mat, creator of Badly Drawn Kitties, master table assistant, and model for our doomed Precocious guest. Since I *am* fragile, my ability to draw commissions may be limited. Drawing all weekend is one of my favorite things about cons, so I'll go until my body says NO MAS, but I'm going to raise rates* so I don't destroy myself in the process. (I will have some $5 sketch cards too, for you cheap-os.) I'm happy to talk with everyone - keeping me talking is BETTER for my health, so please make me feel special! During the con, make sure you keep track of my Twitter feed, as I'll try to post updates on my hours and commission queue there. FYI: I've disabled my already-glitchy store for the con. (I've been too lazy to alert tech guy about that. It's just a quirk brought on by the server move.) Once I'm home, the code is tweaked and I have a tally of my remaining stock, the store will reopen. Info on the Small Press Expo will come when we get closer to the show! I needed a fresh news post on this site, so here! This is me playing around with a little gimmick. Since I'm taking care of a feral cat family, and bribing them so they'll trust me enough that I can catch them and take them to the vets to get fixed, I've been going through a lot of canned cat food. One brand I use has these little cardboard pieces in the cases, and I chose to save them for doodle material. 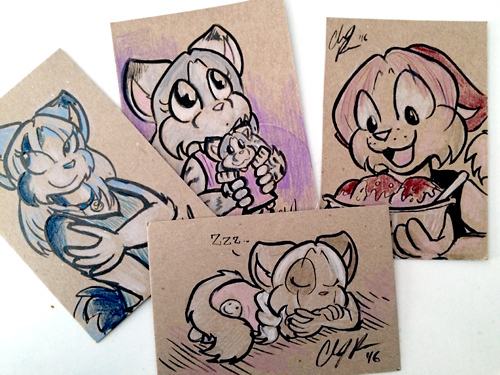 Please enjoy these pics of cat-form characters drawn on cat food box dividers! The goal was to do something nifty, but also quick and loose enough that I can feasibly fit some drawing in during the 5 minutes of upright time I get per day that's not used on keeping this comic updating daily. When life throws hindrances at you, you must learn to adapt. If small sketches are all I can do, then I want them to be special enough to be coveted. Since I cut the dividers in half, they can fit in standard envelopes and go to anyone who wants to buy one. (International orders are fine. I have special stamps!) Use the PayPal/Donate button... wherever it is on this page. (Or just PayPal to the email on the contact page.) Anything given will be put to medical bills, so let's set a $10 minimum, ok? These aren't commissions - more like rewards for charity? You'll get whatever's on top of the pile at the time. Sizes are around 5x3.75 inches, and materials can shift if I practice with other stuff. (These are brush pen and the handful of colored pencils I use for convention sketches.) Apologies in advance if I'm slow or very short with emails. Writing on the computer is very painful for me, so someone might get their card before an email reply.